Los Angeles Therapist: Bruce Levine - Therapist 90048. Send A Message To Dr. Levine. • Dr. Levine is one of the few Board-Certified (ABPP) Clinical Psychologists in all of Los Angeles. In addition to his two private offices at Cedars-Sinai & on Wilshire Blvd in Beverly Hills (close to the Westside), Dr. Levine also currently serves as a Clinical Psychologist at The UCLA School of Medicine. Before moving to LA in 2011, Dr. Levine was Chief of the Psychology Department at South Nassau Hospital in New York and also served as a Clinical Psychologist for the hit TV series "Hoarders" on the A&E Network. Dr. Levine is one of the only Clinical Psychologists in the United States holding triple licensure as a Psychologist in California, New York and Hawaii. • Following a Ph.D. degree at Hofstra University in NY (an American Psychological Association Accredited Clinical Psychology Program), Dr. Levine then completed a two-year Post-Doctoral Fellowship in Cognitive-Behavior Therapy at the prestigious Temple University Medical School in Philadelphia. Post-doctoral Fellowship training is not a requirement for licensing as a psychologist in California and therefore, as you might guess, relatively few psychologists have received this type of rigorous advanced training. 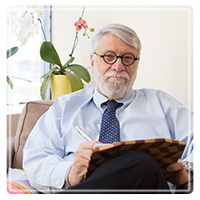 Dr. Levine also has the unique distinction and honor of having been a Member of the Editorial Board of the Journal of Behavior Therapy & Experimental Psychiatry, one of the pre-eminent scientific publications in the field. • Dr. Levine treats the fully array of psychological and emotional difficulties including depression, panic, anxiety-related physical and emotional disorders, relationship issues, OCD, sleep and stress-related problems, intrusive thoughts, family and marital conflict, social anxiety problems and post-traumatic disorders. When appropriate, he can also employ biofeedback therapy for patients with chronic pain disorders and those needing stress reduction techniques. You will also have the added security of knowing that he has more than 25+ years of experience as a Psychologist! • Keep in mind that there is no actual license issued by The State of California as a "Psychotherapist." This is a term used to convey the idea that someone provides psychotherapy. Psychotherapy (and thus the idea of a "psychotherapist" or someone who provides psychotherapy) is actually provided by persons of several licensed professions including Clinical Psychologists, Psychiatrists, Marriage & Family Therapists, Clinical Social Workers and Clinical Counselors. If you prefer to see an actual "Psychologist" make sure you get what you want. If you prefer to further insist upon seeing only a "Board-Certified Clinical Psychologist," make sure you get what you want as well (see above). It is well worth just a few extra minutes of your time to investigate the background, profession and training of someone you will be trusting with your very important personal issues. Be an informed consumer of psychological services because you deserve it! "I have comfortable and private offices in Beverly Hills on Wilshire Blvd, close to the Westside, and at Cedars-Sinai Medical Tower in Los Angeles. When you phone, I will answer your call personally. I am concerned about insuring your total privacy and confidentiality and therefore you will never be forced to discuss your personal issues or leave your name or phone number with some unknown secretary, stranger, answering service or receptionist. Unlike some practices, you will also never be transferred to an associate or intern and, if required, internet (video/audio) visits can also be arranged. Please call my secure private line (323-250-2256) or email me personally at BHpsychologist@gmail.com to set up an appointment. I think you will find me really easy to speak with, compassionate and worthy of your trust. I am here to help you!" Levine, B.A. & Wolpe, J. In-vivo desensitization of a severe driving phobia through radio transmission. Journal of Behavior Therapy & Experimental Psychiatry, vol 11, 281-282. Perr, H. & Levine, B.A. Pitfalls and dilemmas in the diagnosing process. Psychosomatics, vol 21(4), 345-348. Levine, B.A. Treatment of trichotillomania by covert sensitization. Journal of Behavior Therapy & Experimental Psychiatry, vol 7, 75-76. Chaplin, E & Levine, B.A. The effects of total exposure duration and interrupted vs. continuous exposure in flooding therapy. Behavior Therapy, vol 12, 360-368. Mannion, N. & Levine, B.A. Effects of stimulus representation and cue category level on exposure (flooding) therapy. British Journal of Clinical Psychology, vol 23, 1-7. Levine, B.A. Effects of depression and headache type on biofeedback for muscle-contraction headaches. Behavioural Psychotherapy, vol 12, 300-307. Ott, B., Levine, B.A. & Ascher, L.M. Manipulating the explicit demand of paradoxical intention instructions. Behavioural Psychotherapy, vol 11, 25-35. Cornelio, R., Levine, B.A. & Wolpe, J. Treatment of handwriting anxiety through an in-vivo desensitization procedure. Journal of Behavior Therapy & Experimental Psychiatry, vol 11, 49-51. Levine, B.A., Sherry, G., Gorman, S. & Tepfer, K. Fear survey response as a function of item specification. The Journal of Psychology, vol 98, 171.